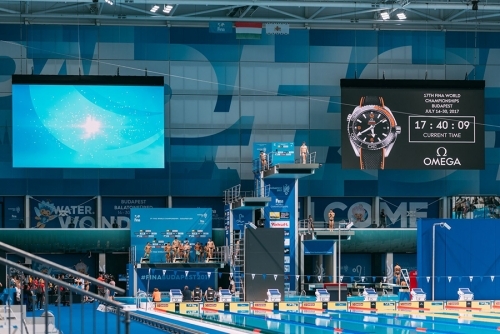 Giant Unilumin LED screens were mounted in five sports venues and were integral to every competition. AV Spring Ltd. supported the operations team with engineering plans for the AV systems and provided technical training for key personnel. At Lake Balaton the team managed four 15-20 square-meter LED screens positioned inside and outside the lake with Analog Way’s NeXtage 08 - 4K, a powerful, seamless AV processor based on the LiveCore platform. The biggest venue was the new Danube Arena where two Analog Way Ascender 32 - 4K multiscreen processors with output expanders, also based on the LiveCore platform, managed the 600 square-meter LED walls. Other Analog Way gear deployed for the championship included the Pulse² - 3G high?resolution seamless switcher, the Vertige VRC300 premium remote controller, the RK-350 remote control keyboard, and a control box.